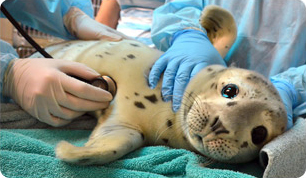 The Marine Mammal Center partners with Duke University through their summer program, DukeEngage. The program provides full funding for selected Duke undergraduate students to participate in an immersive summer of service. In the past five years, The Marine Mammal Center has been proud to host 9 Duke students. The DukeEngage Internship is a unique organization-wide internship where students spend one day a week supporting different aspects of our non-profit. The DukeEngage Internship is a full-time internship 40 hours a week and is located at our Main Hospital in Sausalito, CA. Only currently enrolled Duke University students may apply. Students are required to secure their own housing and transportation during their internship. Ideal candidates serve 5 days a week for approximately 40 hours for 10 to 12 weeks. Time off must be arranged in advance. To apply, please send a resume and cover letter detailing your relevant experience and what you hope to gain from the internship to intern@tmmc.org with the subject line: DukeEngage Internship Application. Duke students must also submit an application through the DukeEngage program to receive funding. The deadline to apply for an US-based Independent Project on the DukeEngage website is January 23, 2019. If your university or college has a similar program and you are interested in partnering with The Marine Mammal Center, please email intern@tmmc.org to discuss partnership options.